The Word of God tells us to be followers (or imitators) of God as dear children (Ephesians 5:1). Since the fall of Adam, sin has distorted the minds of people about the image of God. Jesus Christ was born, died, and resurrected to restore mankind to his rightful place in this earth, and with His righteousness, you always win! 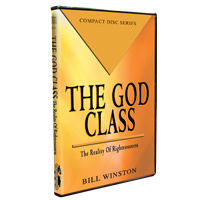 In this three disc series Dr. Bill Winston explains the importance of Righteousness and the impact it has on the image that you portray. In righteousness, there’s boldness, restoration, and victory; there is no fear, inferiority, or sin-consciousness. You have the same attributes in you as Christ has in Him. Jesus came to show us how we are to operate in this earth to carry out what Adam was to do in the beginning. Remember, as a born-again Believer, you are in this world, but not of it. You are born from above (1 John 3:9). You are to walk like, talk like, and act like Jesus! DVD Coming Soon! ($24.00) To purchase, contact a Customer Service Representative at (800) 711-9327.